After witnessing his fellow Cambodians endure poverty, child exploitation, domestic violence and discrimination for years, 24-year-old Hour Chhaileng wasn’t going to let each day pass without doing something about it. Chhaileng graduated from high school four years ago and chose to pursue a university education in social work – completely uncharted territory for local undergraduates and one dominated by foreign aid workers and volunteers. Next month, Chhaileng will be among the pioneer batch of students who graduate from the Social Work Baccalaureate degree program at the Royal University of Phnom Penh (RUPP), the first college-level social work course in Cambodia. “This is the first time such a program has been offered in Cambodia,” says Dalin Meng, head of the department of social work. “There is a lot of need here in Cambodia, and this course plays a crucial role in answering to that need.” To commemorate the completion of their course, the students have been invited to a formal ceremony early next year at which the top students of the program will receive their official certificates from Prime Minister Hun Sen.
Cambodia, a country ravaged by decades of civil conflict and mistrust, is slowly moving out of the shadows of its disturbing past with the assistance of about 2,000 local and international non-government organisations. “After Pol Pot’s reign, there were issues of poverty, street children, domestic violence and more, but we didn’t have the knowledge or skill to help our own people,” Meng says. For two decades, myriad NGOs have come to Cambodia to work on everything from child rights and protection, HIV/AIDS and mental-health issues to disabilities and youth rehabilitation. Some experts, however, feel that the help offered by international organisations and agencies is only short-term when it comes to the future of Cambodia. Today, the country is populated by young people who have not experienced war but are still living with its consequences. “Some NGOs are handing out help to the needy rather than teaching them skills, which is more long-term,” says Meng, who has a graduate degree in social work from the University of Washington in the United States, a close partner that has helped to establish the program. As Cambodia transits from reliance on foreign aid to locals working on the ground, advocates and aid workers hope the local angle will change its ability to address the issues that have plagued the Kingdom for decades. “It’s a very exciting time for social services in Cambodia with this first round of graduates entering the workplace,” says Rebekah Kofoed, a social work technical adviser at Friends International. “Having Khmer social work graduates on the ground will balance well-developed field practice with theory that will provide strengthened services to beneficiaries. The four-year course, which began in September, 2008, was specially designed as a practical, hands-on program to prepare its students for work at local and international organisations as well as in public agencies. “This program provides our students with a more participatory learning environment instead of just sitting in lectures or reading their textbooks,” says Meng, a lecturer specialising in psychological trauma and counselling. The professional degree, which emphasises field learning as a key component, allows students to be directly exposed to the situation on the ground through practicums during their second and third year, as well as a semester-long internship in their final year. 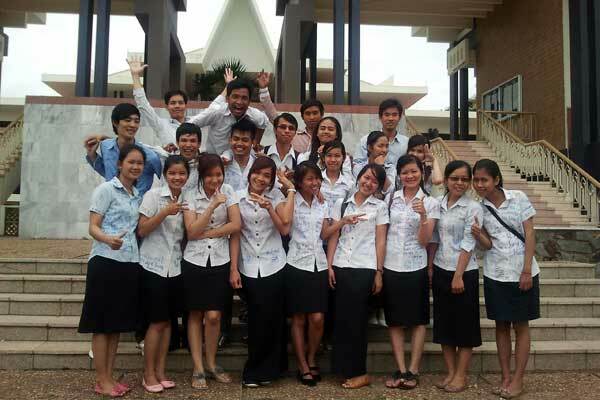 With close to 40 partnering organisations including UNICEF, Maryknoll, Transcultural Psychosocial Organisation and First Step, the undergraduates, who come from 10 provinces, are offered a broad range of opportunities in every facet of community living, from community-based organisations and hospitals to government agencies and NGOs. “The placements allow us to apply what we have learnt in class through the different areas of social work,” says student Hun Sinoun. According to the department, five of the 22 graduating social-work students have already received permanent job offers from various NGOs and government agencies in Phnom Penh. “In a few years, I think many NGOs here will be localised, so they can become more sustainable for the long term,” Meng says. The social-work course, which has gained popularity with high-school students keen to enrol at university, is being adapted into a part-time program in addition to short-course certifications to cope with the demand for long-term aid workers. “If we take a look at the situation in Cambodia today, we can see that even though it’s not perfect, some things have changed,” Sinoun, a former intern with the Advocacy and Policy Institute, says.